Last updated by Mara French on 12/22/09. Numbers in brackets [ ] show the source material and refer to the bibliography at the end of this chart. An asterisk (*) shows continuation of that line. Send corrections or additions to Mara French. Revised 1989, 2008. This is a very extensive ffrench family. There is so much information online about them that I plan to include only a small part here. I am mainly trying to research the connection of the French, ffrench, and de Freyne or De Freigne or De Fraxinis families born in Ireland who immigrated to America. Surname French in Ireland from Counties Wexford, Roscommon, Galway, Cork, Mayo, etc. Originally Norman, the name was de Frenynes, from Latin fraxinus - an ash tree. The ancestor of the family now under consideration went from France to England with William the Conqueror in the person of Theophilus de French with Strongbow in 1066. One line of his descendants settled in Co. Wexford about 1300. A century later a branch of the Wexford Frenches migrated to Galway (in 1425), where his family prospered and multiplied, soon becoming accepted as one of the "Tribes of Galway" - Walter French being Sovereign of Galway (equivalent to mayor) in 1444. A branch of this branch moved into Co. Roscommon, circa 1620, and became the Frenches of French Park, and from this family came Field Marshal Sir John French (1852-1925). Patrick French fitzStephen of Galway is recorded as the earliest member of the family to be associated with Frenchpark. He died in 1667 and is buried in the ruined priory there. In March 1666/7 his son Dominick French of Frenchpark was granted over 5,000 acres in the barony of Boyle, county Roscommon and his grandson John French received a further 2,000 acres in the barony of Ballymoe in 1677. His descendant Arthur French was created Baron de Freyne in the Irish Peerage on 5 April 1851. Arthur French was a member of the Grand Panel for county Roscommon in 1828. 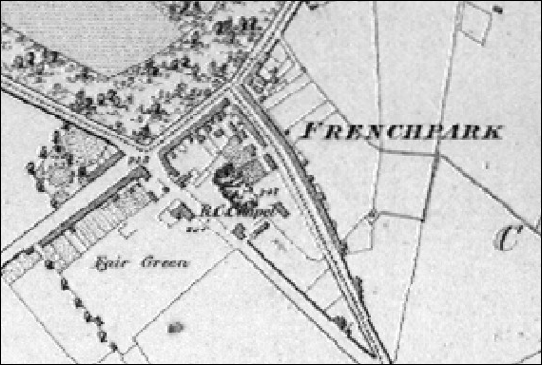 Patrick French, the first descendant of the Frenchpark Frenches, was a descendant of Walter French of Galway who was b. ca. 1425. Patrick French, b. 1583 in Galway, the son of Stephen French of Galway. Patrick was a burgess of the town of Galway and before 1636 he had acquired as mortgages and by purchase, extensive landed property in Counties Sligo and Roscommon. He was deprived of a considerable portion of his property in 1636 by Sir Thomas Wentworth (Earl of Stafford), then Lord Deputy of Ireland. However, in 1656, Patrick French, by decrees of Cromwellian Commissioners, was allotted 6,000 acres in Co. Roscommon. He d. in 1669 "at his mansion house of Dun Gar (now called French Park), built by himself". 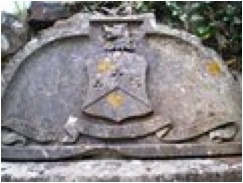 He was buried in the Dominican Abbey near Frenchpark in a vault near the belfry on which are engraved the arms of his family and this inscription:- "Pray for the soul of Patrick French Fitz Stephen, of Galway, burgess, who lived in this world eighty-six years". He may have married into the Martin family of Galway. He had six sons . See FFA Chart on the Galway Frenches. Arms – Erm. A chev. sa. Crest – A dolphin naiant ppr. Supporters – Two dolphins, ppr. The Frenches of Frenchpark belonged to the Roman Catholic Church in the center of the village. The church is full of French plaques. Mara French photographed all the French plaques in the church in 1985. She remembers various large caskets, each about 3� high, covering floor space so it was difficult to walk around, and definitely there was no room for sitting. By Mara�s second visit in 1997, all the monuments and caskets were removed and the church was turned back to the people as a congregation where services were held. 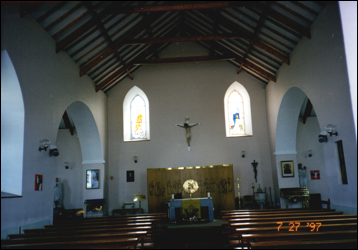 Dierde O�Gara takes care of the old Church of Ireland which is now a museum to Dr. Douglas Hyde. Dierde knows everything about the French family . After the church was turned over to a new priest, the old French plaques and monuments were brought back to the church. 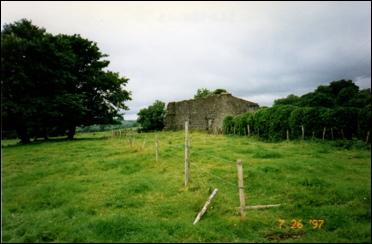 There is a graveyard at Cloonshanville, some distance from the church, where Mara French took many photos of the French clan in 1997. 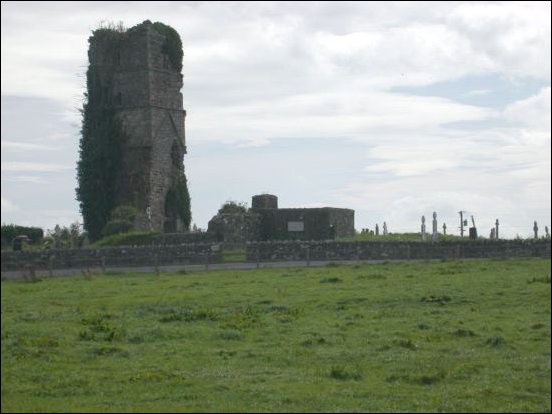 The Cloonshanville Abbey is along the Boyle Road; it was erected in 1385 by MacDermott Roe for the Dominicans. See Cloonshanville Priory below. Photos below taken by Mara French in 1997. The following inscriptions appear on the plaques at the Catholic Church in the center of Frenchpark. The inscriptions were copied by Mara French in Jul 1997 at the church. into thy hands O Lord commends them. The mansion at Frenchpark is a massive structure of brick, with two projecting wings, and was the property of Arthur French, Esq. ; the demesne (the lands of an estate) comprises about 1458 statute acres, finely wooded. Here is a R. C. chapel, towards the erection of which the French family contributed largely. Near it is the rent-office of Arthur French, Esq., where petty sessions were held. In the deer park of the demesne is a remarkable cave, consisting of five rooms, supposed to be druidical . The Frenchpark home does not exist anymore. Only fields remain. Francis French, Ref  says that the gates of Frenchpark were bought by a family called Carvill and they are in Leixlip . He says the gates are fine, but unfortunately the house is now a hotel and though the gates are still there as far as he knows, the hotel made the supporting pillars smaller and ruined the overall appearance of the gates. 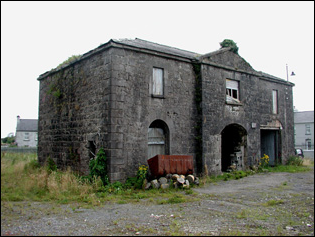 In 1945 Captain Carvill restored the Leixlip house while it was in his possession. In Jul 1985, the house was seriously damaged by a fire which left only the walls standing. The house remained in this condition for many years until it was restored as a hotel. The hotel has come under new ownership in Jun 1996 and has been renovated in its original Georgian style. The building now serves as a four star hotel . Francis French, 7th Baron of Frenchpark, sold the mansion in Frenchpark in 1950 due to lack of money to run it. The land was sold to the land commission and eventually the lovely old Dutch bricks were sold to be reused to build the local milk factory . All of this is very sad and nowadays you wouldn�t know there had been a mansion there . The mansion was still standing in 1997 when Mara French visited and watched it being torn down, but the dove cote, and ice house still remain today as per Ref . French Park House was a three-storey house built most likely to the design of Richard Castle. "Begun in the 1650's by Patrick French, the house was built of bricks which were brought in from Holland". It is said to have been the first and for many decades the only brick mansion in Connaught. 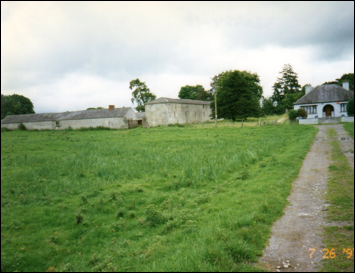 Some of the walls were four feet thick and all the space between the bricks and plaster that faced the rooms was filled with turf which had originally been packed there in the brick-like shape that everyone used as fuel - it was a perfect insulator against heat and cold but the fear of fire was more intense than at Rockingham or Strokestown. French Park House is said to have been more beautiful than Strokestown House - the red brick enhanced the character of the house. The house was lived in until 1952. By then only 250 acres of the estate remained. The last of the estate was purchased by the Land Commission. The contents of the house, livestock, machinery etc. were auctioned; the auction lasted three days. The roof was removed soon after it was sold (1953) and in the mid 1970's what was left of the house was demolished. The Land Commission was responsible for both of these events. When the house was demolished the rubble was used for the foundation of the Shannonside factory in Ballaghaderreen. "All that now remains is an ivy clad brewhouse, the petrified lake and a souterrain of a once prosperous domain of Lord De Freyne. Very faintly the red bricks which formed the wings and archway from the non-existent central block, can be seen in the course grass". Former smokehouse at Frenchpark Demesne, built ca. 1730, now derelict. In the grounds of the former house is a five-chambered underground refuge, or souterrain, and to the east are the remains of the 1385 Cloonshaville Dominican Friary. The French family were originally Norman, who came to Ireland with Strongbow. A branch of the family settled in Galway and became wealthy salt merchants. The mid 17th. century was a time of great upheaval with war, famine and the "Curse of Cromwell." Many of the native land owners were forced to leave Ireland for the Continent. The Frenches were one of the families at this period and acquired a vast estate. They settled at Dun Gar (Frenchpark) in the 1650�s, where they built a large Jacobean style house with Dutch bricks imported via Galway. As their wealth grew, so did Frenchaprk House. Wings and a third storey were added in the 1700�s. In 1839, Arthur French of Frenchpark was created the first Baron de Freyne. Frenchpark House was demolished about thirty years ago. Another description: French Park, Co. Roscommon. An early Palladian winged house of red brick; probably built 1729 by John French to the design of Richard Castle, 3 storey 7 bay centre block, 3 bay pedimented breakfront with lunette window in pediment; late-Georgian pillared porch, 2 storey wings 5 bays long and 4 deep joined to main block by curved sweeps as high as they are themselves; the curved sweeps having 3 windows in their upper storey and a soor flanked by 2 windows below. 2 storey panelled hall; stairs with slender turned balusters ascending round it to gallery; panelling with bolection mouldings; walnut graining. Dining room originally hung with embossed leather which was later replaced with wallpaper; C19 plasterwork cornice and rosette and circle in centre of ceiling. Drawing room on 1st floor above dining room, with a Bossi chimneypiece at one end and a late C18 Ionic chimeny piece at the other; good compartmented plasterwork ceiling executed for Arthur French, 4th Lord De Freyne, late C19. Fine C18 wrought-iron entrance gates. Now a roofless ruin, having been sold by 7th and present Lord De Freyne 1953 and afterwards demolished. Photos show the front, the hall, the dining room, the hall and staircase, and the drawing room. Photos unavailable to show. Cloonshanville Priory fits into the movement for reform which began in the Mendicant Monasteries in Connaught after the Black Death (1348-49). The mendicant friars helped the poor, the sick and the lepers and provided shelters for pilgrims and travellers. The Dominican Priory of the Holy Cross is said to have been founded by McDermot Roe in 1385. 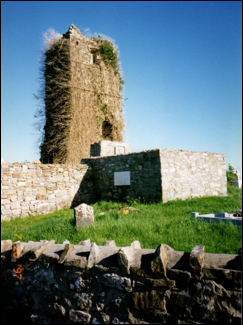 The ivy-covered bell-tower still stands and some ruined walls may be seen. A tall stone cross with stunted arms is located in a nearby field and may point to the presence of an earlier ecclesiastical foundation. An interesting feature is a Piscina in the church. The Piscina was a basis made from Stone and used for washing the sacred vessels. It was placed near the altar and a little drain from it led down to the foundations. 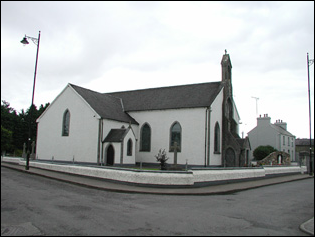 Theobald Dillon got possession of Cloonshanville after the dissolution of the Monasteries. 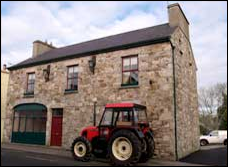 He rented it to John Davis, who succeeded him as collector of the Composition Rent in Connacht. The Dominican Community had to leave and it is thought some went to Rome – and others to Bayonne and Aquitance (France). A Regan Family Reunion was held at this house in Frenchpark with Mary Dwyer in attendance . The house is in the center of Frenchpark and now owned by Mary�s cousin Ton Regan. The previous owners were the Nicholson family, and it was said that they worked in the Lord de Freyne house in Frenchpark. Frenchpark�s old name was Dungar, or the Gaelic name Dun Gar. Named by Dominick French when he made his will there in May 1670. In 1913 it was reported that the date 1667 was painted on a wooden shutter to the circular aperture in the center of the gable, but that this inscription was quite recent, thought it was then alleged to have replaced an earlier one. It appears that Dominick French had a house at Dungar. Dominick�s son, John, named the estate Frenchpark, and both he and his widow made their wills there in 1734. Frenchpark (Irish: D�n Gar) is a village in County Roscommon, Ireland. It was the home of Douglas Hyde, the first President of Ireland. The nearby French Park Estate was until 1952 the ancestral seat of the French family, Barons de Freyne. Upon the sale of the estate to the Irish Land Commission the palatial manor house of great architectural distinction was senselessly de-roofed in 1953 and finally completely dismantled in the mid 1970�s. An historic smokehouse on the former estate is now one of the very few remaining buildings. The loss of the historic house at French Park must be said to be one of the most regrettable of its kind in the Republic of Ireland since the foundation of the Irish Free State in 1922. Source. One event which was significant in terms of Frenchpark happened in August 2007 in London, when 70 members of the French family gathered to commemorate the 80th birthday of the present Lord De Freyne. Family members came from US, Dubai, Denmark, Spain, Portugal, Hong Kong, Scotland and of course Ireland. During the event, Francis, the present Lord De Freyne, sent his best wishes to the families now living in Frenchpark. Source. It is recorded that Sir Humphrey De Freyne accompanied Strongbow to Ireland in 1172. The Norman origin of the De Freynes is from the Latin 'Fraxinuf' - an Ash Tree. It seems that Sir Humphrey's descendant Walter was the first to settle in Connaught, at Galway, where he married the daughter of John Athie in 1473 and another Tribe of Galway was founded. Over the centuries the French's were to become powerful and respected traders in salt. Walter French became Sovereign (Mayor) of Galway in 1520. A descendant of his, Patrick French was a burgess of the town of Galway and before 1636 he had acquired as mortgages and by purchase, extensive landed property in Counties Sligo and Roscommon. He was deprived of a considerable portion of his property in 1636 by Sir Thomas Wentworth (Earl of Stafford), then Lord Deputy of Ireland. However, in 1656, Patrick French, by decrees of Cromwellian Commissioners, was allotted 6,000 acres in Co. Roscommon. He died in 1669 "at his mansion house of Dun Gar (now called French Park), built by himself". He was buried in the Dominican Abbey near Frenchpark in a vault near the belfry on which are engraved the arms of his family and this inscription: "Pray for the soul of Patrick French Fitz Stephen, of Galway, burgess, who lived in this world eighty-six years""
He had six sons and it was from his second son, Dominick, that the De Freyne family is descended. Dominick was succeeded by his eldest son, John, who in turn was succeeded by his eldest son, John (called Tiarna Mor or the Great Landowner). His successor was Arthur, his eldest son, who was elected Knight of the Shire for Roscommon in 1721. His successor was John (Shane Dhu), M.P. for Roscommon from 1743 until his death in 1775, in which year he and his brother Robert were drowned while crossing by boat to England. He was on his way to London to be called to the House of Peers as Lord Dungal. Shane Dhu was succeeded by his brother Arthur, also an M.P., who refused to accept the peerage promised to his brother. His successor at Frenchpark was his son, also named Arthur who in turn was succeeded by his son, also called Arthur (the third Arthur in a row). The latter Arthur became the first Baron De Freyne of Artagh (May 1839) and in 1851 he received a second peerage, Baron De Freyne of Coolavin. He died without issue and was succeeded by his brother John who was a parson in Co. Kilkenny, and when the latter died without an heir, a third brother Charles became the third Baron De Freyne. The third Baron married a local girl from Fairymount named Catherine Maree, daughter of Luke Maree. She was a Catholic and their children were Catholics. The first son of their family, Arthur, became the fourth Baron. He was born in 1855 and he was married twice. His first wife, Lady Laura Octavia Dundas died four years after their marriage. They had a son Arthur Reginald who became the fifth Baron and a daughter. By his second marriage to Marie Georgina Lamb there were five children (actually 11 as further research shows). The fifth Baron De Freyne (Arthur Reginald) was killed in France during World War I (May 9th, 1915 the same day as his stepbrother, George Philip was killed in action). The title thus devolved on another stepbrother, Frances Charles, (the sixth Baron), who died in 1935. His son Francis Arthur John French was the Lord De Freyne until his death in 2009. He was born in 1927. He and his three sisters, Patricia, Patience and Faith emigrated when the Land Commission took over the last of their estate. He now resides in England and is a prominent member of the House of Lords and he has three children, Charles, Vanessa and Patrick. Rathra (or Ratra) House was built by the Hon. John French, brother of Lord De Freyne and rented by him to Dr. Hyde, first President of Ireland, at the beginning of the century (1900). On his marriage to the English/German artist Lucy Cometina Kurtz, The Gaelic League bought the house from Mr. French and presented it to Mr. Hyde. It became the home of Ireland�s first president, Douglas Hyde, and was demolished in the early 1970s. Lord de Freyne held the house valued at �4 10s at Ratra, barony of Frenchpark, at the time of Griffith's Valuation. In 1814 Ratra was the residence of Henry Irwin. A house exists on the site but does not appear to be the original. Offices, the property of Lord de Freyne's estate and valued at �7 10s, were located at Clashcarragh, barony of Frenchpark, at the time of Griffith's Valuation. Virtually no features of this house and landscape are visible today. 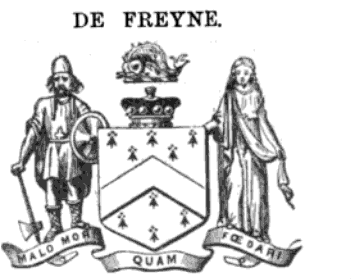 �de Freyne� refers to a person �of France�. Numbers below indicate generations. The generations 5-7 (all the Arthurs) seem to not be exactly correct, and I need to research this information more. The peerage family reports online are each a bit different. Sometimes the word �succeeded� meant son, and other times it meant brother. � Sir Humphrey de Freyne accompanied Strongbow to Ireland in 1172, most likely Bannow, Wexford, Ireland. � In 1425, Walter French migrated to Galway, Ireland and the name French became one of the first 14 �Tribes of Galway�. � In the early 1600s, Patrick French, one of the Galway sons, settled in the County of Roscommon, Ireland, in the village of Frenchpark. � Arthur French, brother of John French �Shane Dhu� and M.P., refused to accept the peerage promised to his brother. 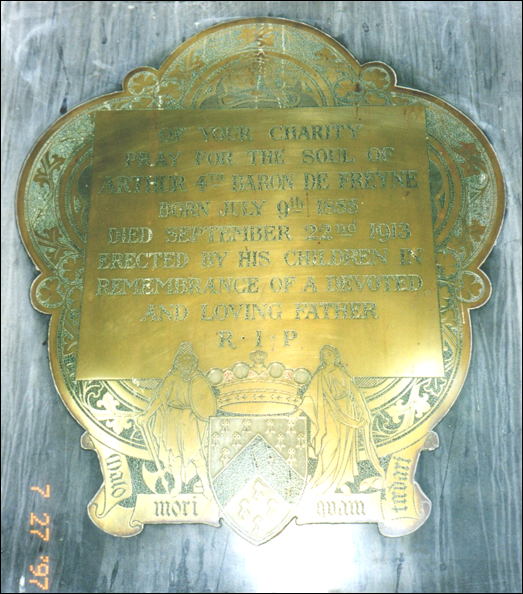 � 7 - Arthur French, 1786-1856, son of Arthur French (3rd Arthur in a row), 1st Baron de Freyne of Artagh in May 1839, and in 1851 he received a second peerage, Baron de Freyne of Coolavin. No heir. � John French, 1788-1863, brother of Arthur French, 2nd Baron de Freyne. No heir. � Charles French, 1790-1868, brother of John and Arthur French, 3rd Baron de Freyne. Married Catherine Maree. � 8 - Arthur French, 1855-1913, eldest son of Charles French, 4th Baron de Freyne, b. 1855. � 9 - Arthur Reginald French, 1879-1915, eldest son of Arthur, 5th Baron de Freyne, d. 1915. � Frances Charles French, 1884-1935, step-brother of Arthur French, 6th Baron de Freyne, d. 1935. � 10 - Francis Arthur John French, 1927-2009, son of Frances Charles French, 7th Baron de Freyne, b. 1927, d. 2009. � 11 – Fulke Charles Arthur John French, 21 Apr 1957-living, eldest son of Francis Arthur John French, 8th Baron de Freyne. � 12 – Alexander French, son of Charles Arthur John French, b. 1987, to be the 9th Baron de Freyne. For Genealogy of this line, go to Genealogy. � Lord De Freyne, address Frenchpark, owned 4,052 acres in Co. Sligo valued at 1,488 pounds 13 shillings. 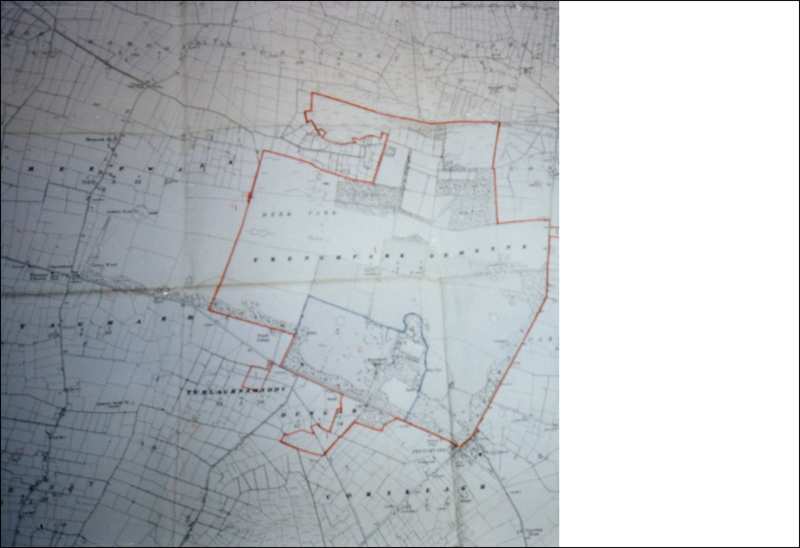 � Arthur French, address Naas, Co. Kildare, owned 1,706 acres in Co. Sligo valued at 404 pounds 10 shillings. � Col. Fitzstephen French, address Lough Erret, Frenchpark, owned 1,224 acres in Co. Sligo valued at 427 pounds 4 shillings. � Robert French, address 10, James's-terrace, Malahide, owned 522 acres in Co. Sligo valued at 239 pounds 12 shillings. � Arthur Ernest De Freyne, b. 22 Jan 1912 in London, Middlesex, England, d. 1982 in Daventry, Northamptonshire, England. To come later when I find my written material and photos. Can someone identify this house for me? 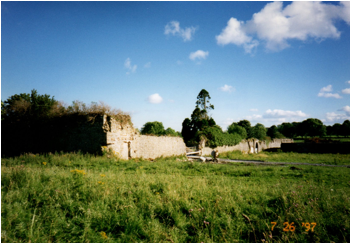 About 1/2 mile from Frenchpark, but probably still in Frenchpark, is Cloonshanville Priory where the Dominican Abbey ruins and cemetery exist. Here is a tribute to Patrick French as I photographed below. 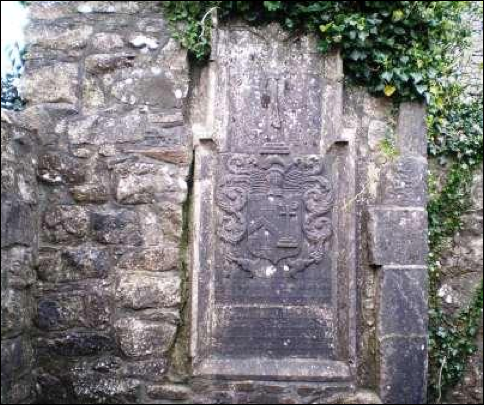 He was the first French in Frenchpark and was buried in Coonshanville at the Dominican Abbey in 1669. This tribute was erected July 29, 1994, so when I arrived there in 1997, it was in good shape, but difficult to photograph. 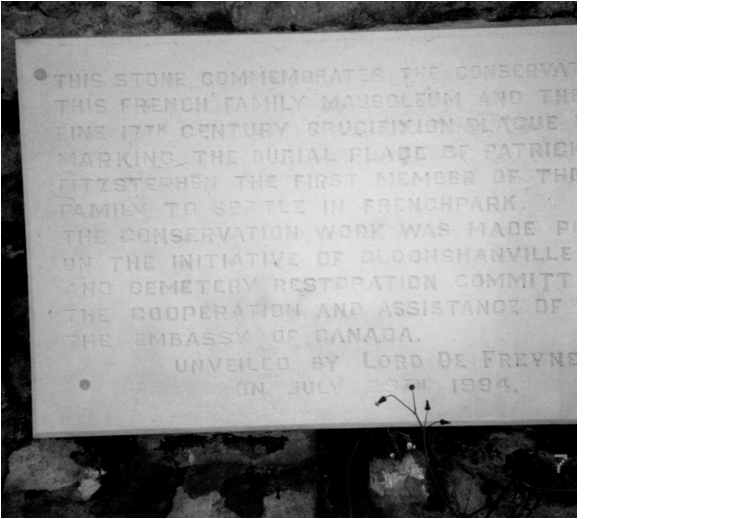 �This stone commemorates the conservation of this French family mausoleum and the very fine 17th century crucifixion plaque inside marking the burial place of Patrick French Fitzstephen the first member of the French family to settle in Frenchpark. The conservation work was made possible on the initiative of Cloonshanville Abbey and demetery (Demesne?) restoration committee with the cooperation and assistance of FAS and the Embassy of Canada. At one time, this abbey bore the arms of the French family. Now it is thickly covered with ivy and bird nests, as I photographed it below in 1997. The only still surviving Frenches in Roscommon apparently live in Kilmore (twin brothers). Austin Deane is the only one in Frenchpark who could tell me about the Frenches. He wasn't at home. Douglas Hyde, a historian, died a long time ago. I also went to Foxborough House where Simon French, Arthur's brother, lived. The 90-year old man who lives directly in front of the house ruins, James Rourke, says the Taft family lived there and never the Frenches. It's strange that they built is rather new small house directly in front of the ruins. The ruins are massive. I hope all my photos turn out. James Rourke says the French Coat of Arms was worn on the harnesses and the dolphin was shown on the coats of many deliverymen. Their blessings were "Death before Dishonour". July 27, 1997, Sunday. Today I had planned to make a quick return trip to Frenchpark to see Austin Deane, but maybe I'll do that later on when the Stokestown Heritage & Genealogical Library is open. I suppose it is 2 hours drive from Galway, but only 1-hour drive from Roscommon where I am now. I must think about this shortly. Well, I decided to return to Frenchpark. There were just too many unanswered questions regarding the church and French home. It was only 1/2 hr back. I guess driving at night just seemed longer because I was tired, even though it doesn't get dark around here until 10:30. It's amazing. At 8 p.m. the sun looked like it would be 2 p.m., then it goes down quickly. Anyway, as I set off for Frenchpark, I took the wrong road. It was a beautiful road with many fantastic B&Bs, all decorated with flowers. I didn't remember all those nice B&B, especially since I had been looking and ended up staying in a horrible one in Roscommon for 13 pounds. So I stopped and got out the map. Miraculously I noticed I was very near a place called Frenchlawn. Upon visiting there, Marcus Murray (I think this was actually his father's name), had some papers about the Frenches who built that house. They married into the very wealthy O'Connell family of Dublin, afterwhom the main street in Dublin was named. The family kept their famous O'Connell name and were known as "John" O'Connell French. Marcus says he'll copy the two pages for me and send them to me in America. On them I noticed several Daniel Frenches -- I was looking for one who went to America, but apparently this is the wrong line, 200 years later wrong, and the name Daniel came from the O'Connell side. Also on his chart was a Morgan French* who died unmarried, but went to America. He was in the 3rd generation, so born about 1860. I need to check this at home. The only one left from this family is Leonora O'Connell ffrench, who lives at 107 Morehampton Road, Dublin. Marcus Murray's address is Frenchlawn House, Ballintubber, County Roscommon, Ireland. They drove me to the nearby cemetery and showed me a stone of a French from Frenchlawn who had donated money to build a chapel. This chapel no longer exists, but a small wall around a tree is erected in its place. Nearby is the ruin of the walls of the main church. This French died in 1827, but his name is illegible. *�A� Morgan French was b. in Jan-Feb-Mar 1859 in Merthyr Tydfil district, Breconshire, Glamorgan, Mid Glamorgan in Wales. There is no indication that this is the same Morgan. It further states that �a� Morgan French married Mathilda Hasper on 26 Oct 1879 in Barton County, Missouri. 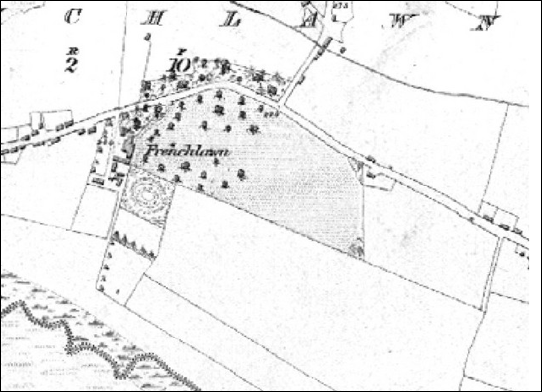 In the map below of Frenchlawn, few features of the designed landscape shown in this 1836-1846 OS map are visible today. Well, back at Frenchpark, I went to the church and took photos of the few French plaques that were remaining after the renovation. They really ruined that church during the last 12 years. I was there in 1985, and since then they took down the lovely old alter and most of the Ffrench (or Lord de Freyne) plaques. Only 2 brass ones remain and one out of stone. Pitty such poor imagination, thought and care for history. I felt so devastated and hurt, but I could tell the townspeople just wanted more space for worshippers, and they had plenty on Saturday. Today being Sunday about 1:00 p.m., the worshippers have left and I had the place to myself. I actually took this computer into the Roman Catholic Church and typed in the memorials on the plaques. It worked very well (see what I typed above). Then off to see Austin Deane. He is a man of 72 years (born in 1925). Everything about him reminded me of the actor Richard Harrison. He was tall, with messy white hair, always waving his arms about, but looking very distinguished and handsome. Austin's father had worked as a blacksmith for Lord de Freyne at his estate. At that time, he had 40 housekeepers. The house was three stories, plus a full basement. Beyond the large front entrance was an ice house and a circular smoke house. Most of the smoke house remains today, but is heavily covered with ivy. Ivy destroys these old buildings. That is one reason they had to shorten the wall around the French estate because much of it was destroyed by ivy, plus the city could gain a lot of money by selling the stone. The photo below shows the smoke house on the right and the large mansion in ruins on the left. When I was there in 1985, I couldn't even see what was over those 12'-high walls. Today the walls are 3'. What a shame, but I was able to be snoopy and just walk right on the land. This is probably Frenchlawn, but can someone identify this photo? I took several photos (land and partial high walls above) and videos of the house walls and the chapel. 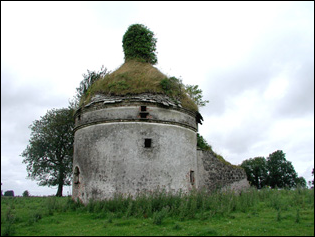 Also, in spite of the cows being very close by and ready for charging, I took photos of the smoke house, which almost looks like a bird house and is actually called a dovecoat as explained to me by Mary Dwyer (in 2009). It was used to smoke meat and game for use in the main house. It is now a protected structure in that there is a preservation order on it by the Heritage Department. It�s very rare now in that not many of them have survived, as Mary Dwyer emails me. The sun was facing the main house, or I should say the ruins. The walls are only a few feet high. 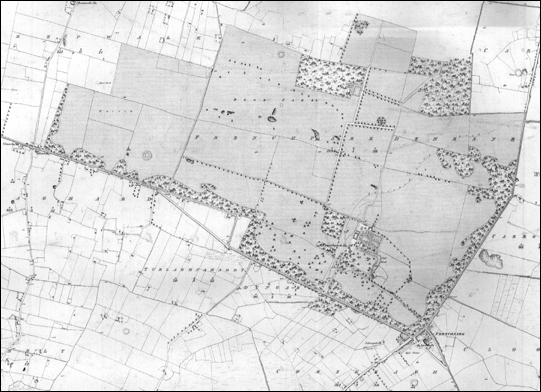 Below is a photo (for a lack of a large copy machine) I took in 1997 of the Frenchpark Demesne enclosed with red ink drawn in 1929. The map belongs to Austin Deane, and that is his hand on the right. I can read the words �Deer Park� on the left, and I assume the red line on the right is Frenchpark�s main street going down to the corner of town which is the center nearby where the church is. I would assume the area in blue is the mansion, but I�m not sure. Austin had a 1929 map of the French territory which was thousands of acres. It showed the house and smokehouse just as I saw them and imagined them. 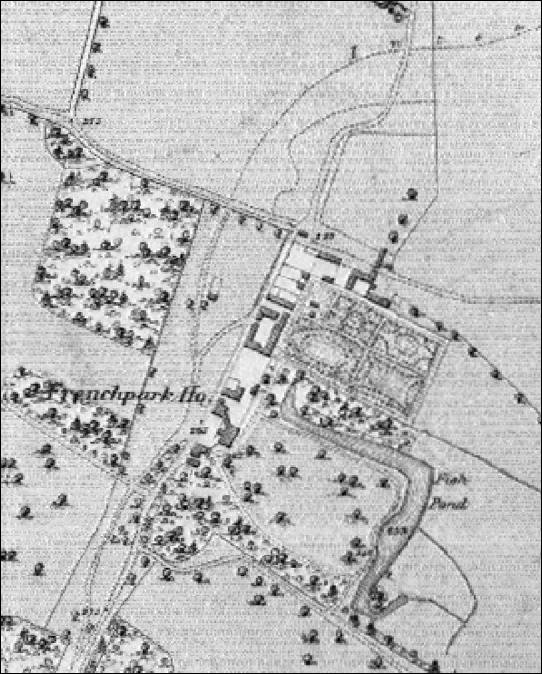 The 1839-1849 map below shows more features of the Frenchpark mansion. On the upper-half of the map, you see a vertical road with a slight jog in it. At the bottom of the road is the entrance to the mansion through an arched wall (see photo directly below). Going away from the mansion on that same road, you will reach the smokehouse (see panoramic view below of the walkway between the mansion and smokehouse which I took in 1997. The road goes just to the right of the circular smokehouse. The wall and archway in the photo above surrounded the mansion which cannot be seen to the left. The photo below clearly shows the road from the broken-down wall to the smokehouse. The full-view plan below shows the many acres of the mansion and demesne. You can clearly see the mansion and the road leading vertically to the smokehouse. 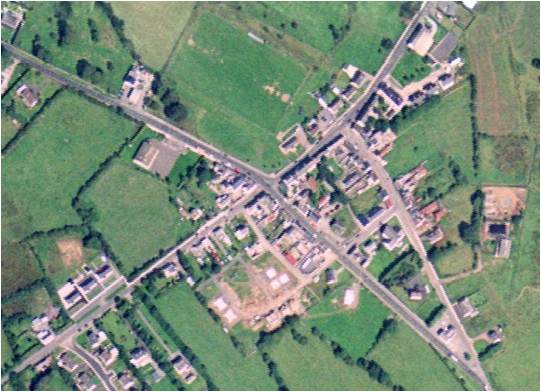 In the lower-right corner is the center of the town of Frenchpark, very small in comparison to the demesne. The town center shows the Roman Catholic Church location (see enlargement below). Below is current aerial view of Frenchpark center. The boundaries are visible today, but the mansion is not, other than the photos I took in 1997. Today no garden structures, gateways, and gatehouses exist; only the woodlands and smokehouse exist. The peripheral landscape of this site is indistinguishable from surrounding farmland. Sheelin (O�Kelly) De Freyne. Her husband, Francis French, 7th Baron of Frenchpark, has a video of FrenchPark he took when he was about 16. It was film, but his wife put it on video years ago. She also has a most moving film and a pem written recently about his grandmother and her sorrow loosing her boys in The Great War that she could copy and send, along with Francis� 80th birthday party in London. She is fairly busy at the moment. A cousin of Francis, Maurice French, wrote a very handy and good family book, �The Frenchs of FrenchPark�. Francis and Sheelin De Freyne live in Oxfordshire and 44 mns from Paddington. �County Families of the United Kingdom� by Walford. London, Chatto & Windus, 111 St. Martin�s Lane, Charing Cross, 1899. Copied from the National Library in Dublin, Ireland. �The Houses of Ireland�, by Brian De Breffny and Rosemary Ffolliott, Thames and Hudson, London, 1975. From an article on Frenchpark in the library of Edward Heazle, Drumcannon, Tramore Rd., County Waterford, Ireland. Austin Deane, Historian of Frenchpark, died about 2006. Wife is Dympha of Frenchpark. Mara visited them in 1997 and she will add his documents and photos later. Dierde O�Gara, church keeper, has a small guest house called �Lake View� just outside Frenchpark. She looks after the old Church of Ireland which is now a museum to Dr. Douglas Hyde. G.E. Cokayne; with Vicary Gibbs, H.A. Doubleday, Geoffrey H. White, Duncan Warrand and Lord Howard de Walden, editors, The Complete Peerage of England, Scotland, Ireland, Great Britain and the United Kingdom, Extant, Extinct or Dormant, new ed., 13 volumes in 14 (1910-1959; reprint in 6 volumes, Gloucester, U.K.: Alan Sutton Publishing, 2000), volume IV, page 114. Hereinafter cited as The Complete Peerage. Also, Cokayne, and others, The Complete Peerage, volume IV, page 115. Website: http://www.thepeerage.com/p23333.htm and http://thepeerage.com/p8068.htm. http://www.thepeerage.com/index.htm. Over 150 with the surname French, and many more with the surname de Freyne. The French Family of Galway. This website on the French family is 2 pages. Dear Barry Arthur French, Concerning your message "French's of Frenchpark", of November 12, 2001, my distant cousin Tony Ffrench corresponded with an Arthur French of the British Forces,in 1963, who wrote that his great, great grandfather was John French of the Protestant branch of the De-Freyne family of Frenchpark, who moved to Mornington Park, Dublin in 1819 when the head of the family married a Roman Catholic. The next 3 generations were all George Arthur French and the family moved to Newbay Wexford in the 1890's, where his father was then living. Arthur French was the eldest hence Arthur and his brother then in Canada was Dominick. His father was interested in the family tree. In fact my cousin Tony was invited to Newbay Wexford to meet Arthur French's father, and was shown interesting family portraits, which my cousin photographed. My cousin Tony says the estate was later sold, he thinks, and also the family portraits sold as well? Do you know more of this? A couple of years ago, in Manchester, I also met an Andrew Korn, whose mother, I think, was a French, growing up in Newbay, Wexford, father Col. George Arthur French. I have a telephone number and email address written down for Andrew Korn. Tony Ffrench and I are descended from a Dominick French, born around 1750, who was a mate with the East India Company Merchant Navy and became a businessman and ship insurer. During the making of a documentary film on ancestors, in which my son Sam and I were involved, we were told, a few years ago, that our Dominick may have been an illegitimate son of Arthur French of FrenchPark, and we met the son of the present Baron De Frayne. We were told, that on the female side of the French family the French's of French Park were distantly related both to the Queen and to Princess Diana. Eventually, Tony, my son Sam and I visited French Park, now a ruin. Dear Mara, I have a copy of the book and will check it for a contact number, and let you know later. I will also check your attachments but I prefer to do this on a library computer as I am always afraid of viruses. However I will send you info on our French branch later. Suffice it to say for the moment that my grandmother, Annie Elizabeth, was a Miss French (actually they spelt it with two ffs for some reason), before her marriage. Her father was a Martin French, and his father was a Michael French, one time judge in Madras. His father was a Dominic or Dominick French, one time first mate in the East India Company Merchant Navy, subsequent business man, ship insurer and Lloyd's name. He was Irish, and had spent about fourteen years at sea, on various vessels. We were told his wife was Spanish, but this must have been his first wife as his second wife, our ancestor, did not appear to be Spanish. Her maiden name was also French. Hi, I lived for thirteen years in Ireland. 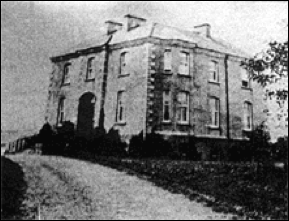 Our family home was Newbay Co wexford, my g grandfather purchased from my gg grandfather Thomas Jefferies. My gg French was 1st commisioner of rcmp in Canada, served in Australia where he put down the rebellion and was knighted a KCMG, his father John French of Mornington Park in Dublin, he was a builder and it is generally thought he came from Frenchpark but there is no official record of this. His brother was Jack French, inspector RCMP, kia a Batoche in the Loius Riel uprising leading French's Scouts and has issue. G grandfather was a Colonel and Companion of Saint Micheal and St. George, assistant quartermaster general during ww1, accepted surrender of the troops in Wexford after the Easter Rebellion. Percy French stayed at Newbay on several occasions with my grandfather, George Arthur French III O.B.E and claimed cousinship. If anyone needs some information about this family, I believe I can help them out on this. Mark Bence-Jones, A Guide to Irish Country Houses, Constable, London, 1978, p.128, illustrated. Russell Gant, email: Russell.gant@btinternet.com (email good in 2009). Ellen Walford is listed in the 1841 census, age 20, b. ca. 1821 in Middlesex, England at St. Marylebone, Ossulstone (Holborn Division), Middlesex, England, living with her 2 children: Theodore Walford age 4 and George Walford age 2. By 1851 she is listed as living with Arthur De Freyne, age 60 (therefore he was born ca. 1791), and Mary French (perhaps his daughter), age 34. Ellen Walford is 31 and still with her 2 children Thurden 14 and George 12. Ellen is listed as a �visitor�, born ca. 1820 in London in the parish of Paddington, where Arthur De Freyne is the head of household, deaf, born in Dublin, Ireland, and Mary French is a �visitor� b. ca. 1817 in Duke St. G Square, Middlesex, England. By 1861 Ellen Walford is 40, Theodore Walford is 24, George Walford is 22, and they are living with Mary French, age 50, b. ca. 1811 in Marylebone, Middlesex, England, head of household. By 1871, Ellen Walford is 50, the widowed mother of Theodore Walford age 34 and his wife Mary A. Walford age 25 who was the mother of Florence Walford age 1 and Theodore Walford age 4, all living in Christchurch, London. Mary French would have been 60, but she is no longer listed. Mary Dwyer, email: mary.dwyer@welfare.ie (good in 2009). She lives in Frenchpark, but is not related to the French family. She has a copy of the The Frenchpark House album relating to The Lord De Freyne�s 80th Birthday Party. She also has corresponded with Vanessa Rose French of Generation 10.